Today, over 70 communities across Canada are solemnly holding vigils for hundreds of missing and murdered Aboriginal women. 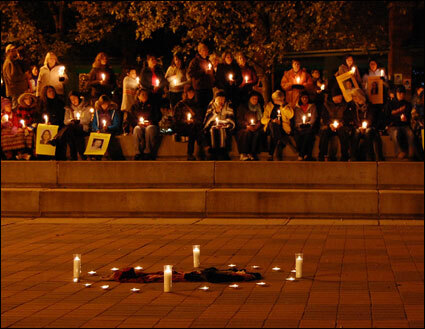 As part of the Sisters in Spirit national campaign spearheaded by the Native Women’s Association of Canada, the vigils call to national attention and action the continued tragedy of Aboriginal women’s over-representation in female disappearances and homicides across Canada. MEDIA INDIGENA has reported before about the unacceptable statistics of murdered and missing Aboriginal women, as well as discussed the structural violence and underlying conditions such as homelessness, poverty and racism which position Aboriginal women in unsafe living and working conditions. Like other Canadian cities, the Winnipeg community will be holding a vigil tonight. Leading up to this gathering, a unique series of public actions across the city took place, organized by the Stop Violence Against Aboriginal Women Action Group (SVAAWAG). This line of concerned citizens stood in silence while people passing by read statistics and messages printed on the back of the shirts, messages like “Aboriginal women and girls are people too.” These activities aimed to educate Winnipeggers about the deplorable levels of violence borne by Aboriginal women and girls and gain their support for putting an end to this travesty. « Winnipeg Election Q&A with Mayoral Candidate Sam Katz: Add your voice! Pingback: Linking to additional media coverage… | Showing Up, Speaking Out.